This year 4th Cheltenham Company were able to secure a stall to promote The Boys’ Brigade at the annual Greenbelt Christian festival. 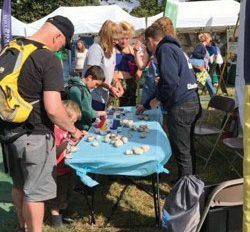 The 4-day event held over the August Bank holiday weekend attracts families, youth and Churches from across the country with some 12,000 in attendance. Company Captain, Jacquie Boyer after being at Greenbelt the year before thought this was a fantastic opportunity to promote the work of the organisation and got things in place to have a presence in 2018. With the help of Leaders from 1st Tewkesbury Company they setup in the marketplace with a stall providing information and running a number of engagement sessions including rock painting, lost sheep cakes and biscuit decorating which attracted hundreds of children and young people. During the festival 7 Churches took an interest in starting a Company, 200 families were given details of Companies in their area, 6 new volunteers were pointed in the right direction and over 1000 leaflets were given out too.